Get perfectly mixed concrete delivered on-site to your construction project exactly when you want it. Whether you’re laying a patio or a commercial foundation, no delivery is too large or small. Finish your project with ready mix that meets the rigid standards of the National Ready Mix Concrete Association. You will speak directly with a dispatcher who knows concrete, and knows exactly where his trucks are located and can give you a "Be There" order. Two convenient locations in Waterford and Auburn Hills each have fleets of concrete mixer trucks that will meet your demand. Check out our Facebook page and give us a "like." Call 248-623-6000 (Waterford) or 248-332-9169 (Auburn Hills) to place your ready mix order. Click on our concrete calculator or give us a call, we'd be happy to help! 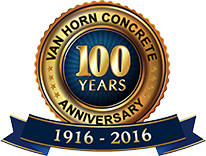 Established in 1916, Van Horn Concrete has proven itself a lasting leader in the Ready Mix Concrete and Construction industry. Auburn Hills: 2294 Auburn Rd.